Description. 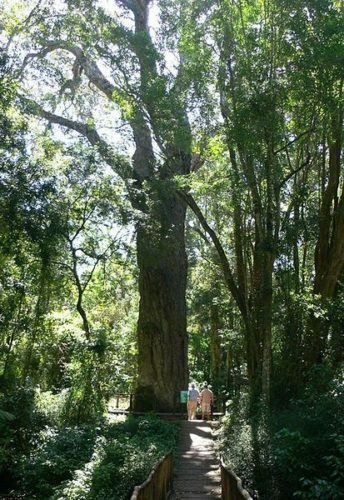 Outeniqua yellowwood is a medium-sized to large coniferous species of tree which will grow to mature heights of 30 to 80 feet (10 - 25 m) tall and sometimes to heights of 200 feet (60 m) with a trunk up to 6 to 10 feet (2 - 3 m) wide, living for hundreds of years. Mature trees have a rougher, scalier bark than that of younger trees. The leaves are spirally arranged, lanceolate or falcate (sickle-shaped) to a very sharp point, 0.8 to 1.6 inches (2 - 4 cm) long and 0.08 to 0.16 inch (2 - 4 mm) broad. 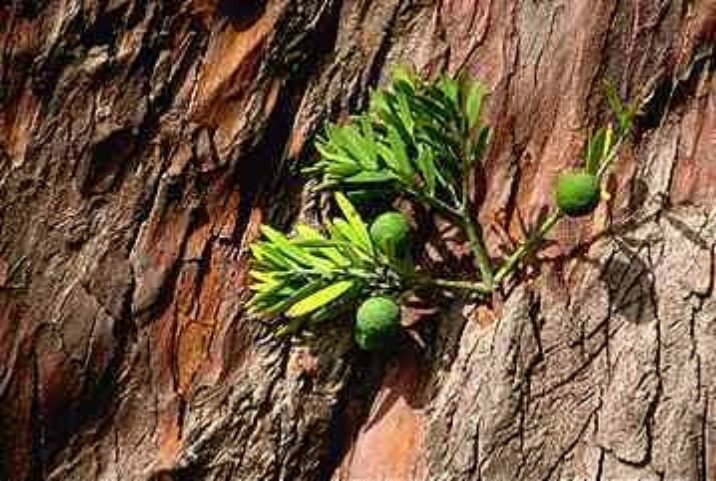 It is a dioecious species; pollen cones and seed cones are found on trees of different gender. The brownish, catkin-like pollen cones are produced in clusters of 1 to 4 on short stems. They are 0.2 to 0.5 inch (5 - 13 mm) long and and 0.08 to 0.14 inch (2 - 3.5 mm) broad. The seed cones are highly modified, with a single large seed with a thin fleshy coating borne on a short peduncle. The fruit takes a year to mature, turning yellow, and is dispersed by birds and monkeys which eat the fleshy coating, a necessary step for growth since the flesh contains a germination inhibitor. Distribution. This species is native to South Africa, from Swellendam District of Western Cape Province to Limpopo Province, and into southern Mozambique, where it grows in occurs in coastal and montane forests. It is a protected tree in South Africa. 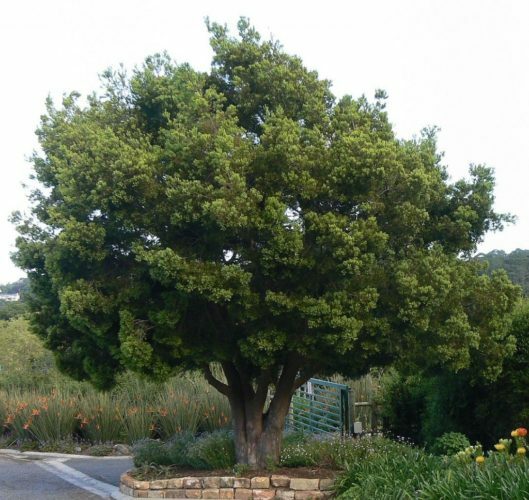 It is often grown as an ornamental tree, especially in South Africa, and occasionally abroad. Afrocarpus falcatus — bark, foliage and immature fruits on a tree in the Sydney Botanical Garden, Australia.